The gift of discernment is a much needed gift right now especially with the times that we live in. 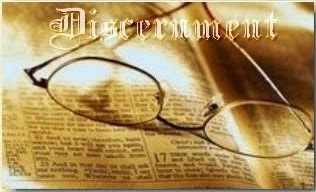 There are several types of discernment that is important for members of the Body of Christ to walk in. There is the supernatural gift of discernment, where through the Holy Spirit, you know something about a person or situation that you wouldn't otherwise know. There is discernment that comes out of a relationship with Christ, enabling a person to recognize what the Holy Spirit wants to do and say in a given situation. And there is a natural discernment a person acquires from life experiences. When a Christian walks in all these dimensions of the gift, rooted in love, it can be very powerful! Immediately, Jesus knew in his Spirit that this is what they were thinking in their hearts and he said to them, "Why are you thinking these things?" Jesus was able to say this because he had a mature character and acted out of love. When I started following Christ at the age of 19, I would discern a lot of things about the people I would come in contact with on a daily basis. However, I did not yet have the character to act on it or the level of maturity to be able to handle the things I was seeing. One of my biggest character flaws has been in the area of my speech. One of the Saints I have been able to relate to most since my conversion in 1988 is St. Peter. From what we know from scripture, it seems he was always putting his foot in his mouth and sometimes saying inappropriate things. It is very encouraging that the Lord ended up appointing him as the leader of the Church. Out of Peter's love and relationship with the Lord he finally learned to to discern who Jesus was and what the Holy Spirit was doing (Matthew 16:17) and the Lord ended up using him mightily. Part of the reason I believe I struggled in the area of my speach is because growing up communication was something my family was lacking in. When I was a kid, instead of being told that I was saying something out of line or inappropriate, I would receive dirty looks. I did not always know however why I was receiving dirty looks. This may sound odd but it got to the point where I would purposely say inappropriate things just so I would know why I was receiving the dirty looks. After my conversion 26 years ago, this is the thing I struggled to overcome the most. I always found myself saying inappropriate and wrong things. One of my main prayers was that Jesus would give me discernment in this area and that he would help me be socially appropriate. What I have learned over the years is that discernment doesn't always miraculously drop into our mind. As I have learned to lean back, rest in Jesus' love for me, and surrender to his perfecting love and transformation, I have learned to better discern and make decisions based on love. For example, before speaking, I now first naturally ask myself the question, "If I say this, will it edify and encourage those I am speaking to?." "If I say that, will it make someone else look or feel bad?" This has also helped me to know when I am crossing the line into gossip. God can use anything from our past for his purposes (Romans 8:28)! Some ways my dysfunctional childhood helped me in the area of discernment and how the Lord is using it is that I learned to pick up on body language and words not being said or the meaning behind words. I can often tell if someone has ulterior motives and can not be trusted. I can also usually tell if someone is being genuine which has also helped me be more genuine; after all, if I can tell this about others, maybe they can tell this about me. I write this post in hopes that it will encourage someone. The Lord is starting to move me out in ministry. Lately my husband and I have been given opportunities to speak and minister. If the Lord could use someone like me, he could use anyone. I love how the Lord often uses us in the areas we are weakest so his glory is then displayed the most!